Looking For The Best Guitars For Beginner Adults? 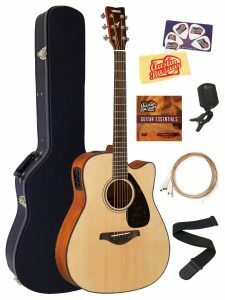 Here’s a look at our favorites, including our top pick the – Fender CD-60SCE Dreadnought Acoustic-Electric Guitar. The guitar is an incredibly fun instrument to learn and play. I got my first acoustic guitar when I was 14, and I used to love doing jam sessions with a few of my friends. It was pretty simple to learn a few beginner chords and strum along as my more experienced friends took the lead. A few years later I added an electric guitar to my arsenal, and while I never joined a band and became a rock star, it was a blast to play. To this day I still have both guitars, and I enjoy pulling both of them out when we have friends over, or if I just need some alone-time to relax and play music. Buying these guitars was one of the best investments I’ve made, as I continue to reap the benefits years later. The big question when you’re buying your first guitar is going to be whether to go with an acoustic or electric guitar. You’ll hear some people extol the simplicity of one over the other, but honestly, they’re both equally difficult to learn. Instead of fretting over what’s better for beginners, consider what style of music you want to play. If you like country or unplugged music, then go with the acoustic guitar. If you like rock or jazz, you should definitely get an electric guitar. Most guitarists own both acoustic and electric guitars, so in the long run you’ll probably purchase whichever style you don’t get now. Style – you may have been taught to not judge a book by its cover, but you should throw that mantra out the window when you’re looking at a guitar. Simply put, if you don’t like how the instrument looks, and if you don’t enjoy playing it, then you won’t be inclined to play as often. In time, the guitar will just collect dust and never see the light of day again. Do yourself a favor and pick something that matches your style (bonus points if you’re excited to show the guitar off to your friends!). 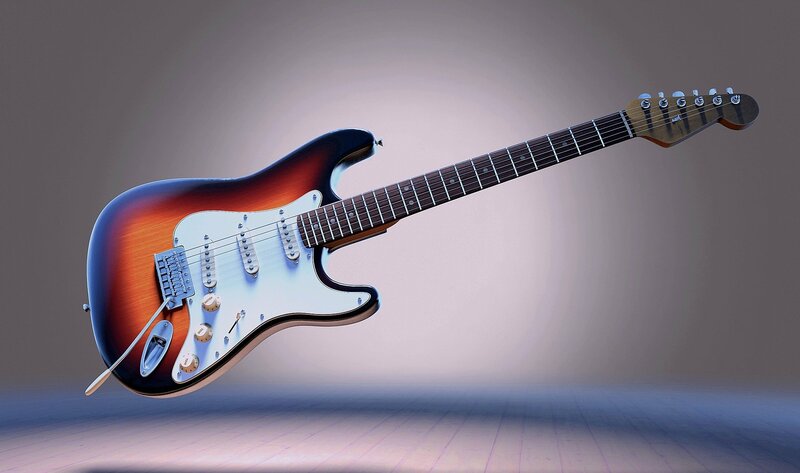 Feel – guitars come in all shapes and sizes. Physical factors such as the length of your arms and the width of your fingers can affect how you play, so you’ll want to pick a guitar that compliments those attributes. The best way to figure this out is to go to the local guitar store and try a few out. Figure out which styles feel natural, then you can go bargain-hunting online for a good deal. Quality – that Angus Young Edition Gibson SG electric guitar looks amazing, but with a price tag of several thousand dollars it’s certainly more of a pro-guitar than a beginner-guitar. If you’ve got the cash to splurge, then go right ahead, but for most people, it’s better to start with something simple to get your feet wet. You should be able to pick up a solid beginner-guitar for less than $500. That said, you do need to watch out for lemons in this price range. Trust the big brands (Fender, Yamaha, Ibanez, Gibson, etc. ), but don’t be afraid to try a lesser-known brand if it comes highly-reviewed. Acoustic-Electric – if you have any aspirations of playing an acoustic guitar in front of a larger audience, or if you want to record your music, you’ll want an acoustic guitar with electric hookup (aka an acoustic-electric guitar). 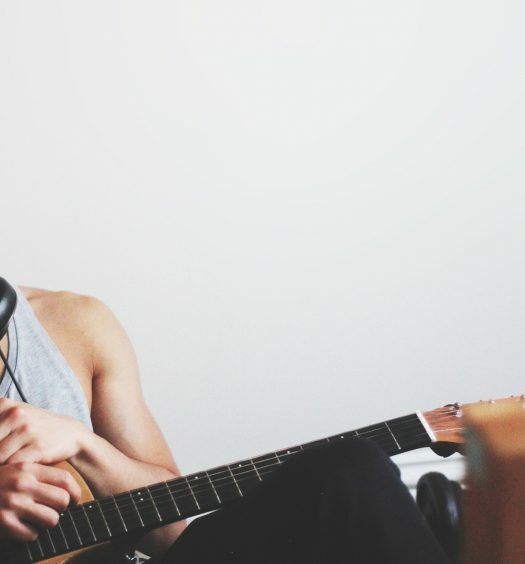 If you’re just planning to jam by yourself at home, or in front of a few friends beside the fire, then a traditional acoustic guitar will do just fine. 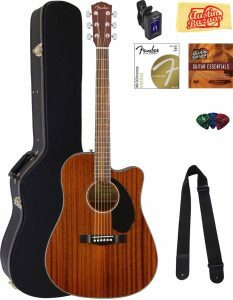 The Fender brand comes with a long tradition of quality products, and the CD-60SCE Acoustic-Electric Guitar is no exception. If you’re interested in putting on shows or playing acoustic guitar in a band, this is a fantastic choice as it’s an acoustic guitar with electric hookup. It can’t shred like an electric guitar, but you can connect the guitar to an amp and crank the volume for large crowds. The CD-60SCE has a Venetian-cutaway body for easy upper-fret access, a solid spruce top with scalloped X-bracing, chrome tuning knobs, a mahogany finish, and a “mother of pearl” style acrylic design around the sound-hole. It also has rolled fingerboard edges, making it nice and easy to play for beginners. 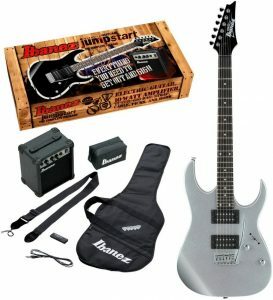 This particular package comes with a hard-shell guitar case, a digital clip-on tuner, a bag of extra guitar strings, a string winder, polishing cloths, picks, and an instructional DVD. The Ibanez IJRG220Z is the ultimate beginner-kit for learning the electric guitar. The guitar is professionally-crafted with a chrome-colored poplar body, a maple neck, a rosewood fingerboard, white-dot inlay jumbo frets, Infinity R pickups, and a standard Tremolo bridge. An electric guitar is nothing without an amp, so this package comes with a 10-watt amp to get you started. It also comes with a soft travel bag, an electronic tuner, a strap, and picks. This particular offering also comes with a lesson card for online lessons. It’s a fantastic package to get you all of the basics you need to learn the electric guitar. Similar to the Fender CD-60SCE, this is an acoustic guitar with an electric hookup to let you crank the volume. The Yamaha FGX800C has louder and stronger sound in the low- to mid-ranges thanks to its newly-developed scalloped bracing patterns. It has a solid spruce top with a cutaway body and nato/okume sides, and it includes Yamaha’s proprietary under-saddle piezo pickup and System 66 analog pre-amp to ensure an excellent plugged-in performance. This particular setup comes also comes with a hard case for safe transportation, an easy-to-use clip-on electronic tuner, a strap, a pack of extra strings, a polishing cloth, and an instructional DVD to help get you started. The Fender Squire Stratocaster was my first electric guitar, so I’m partial to this one. This short-scale Stratocaster (24 inches) is good for musicians with smaller hands, and it has a nice comfortable feel. It’s a fairly light product by electric guitar standards, so it’s not too much of a burden when you throw on the strap. 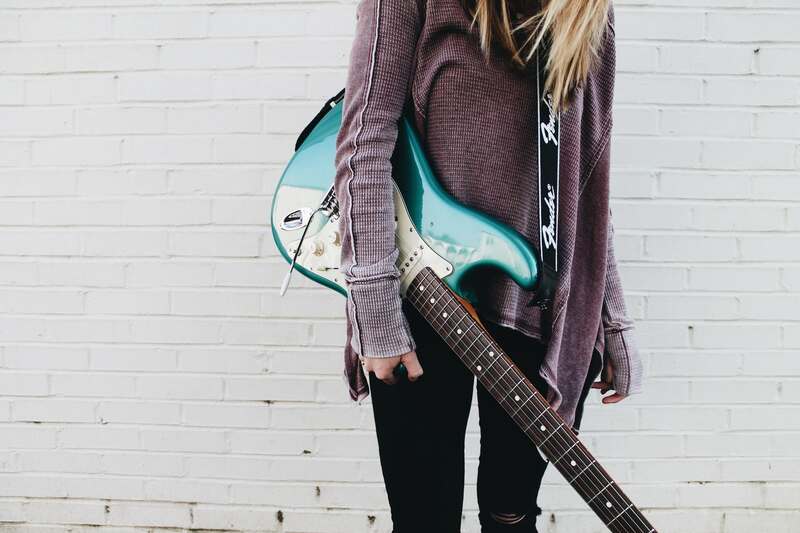 Without getting too technical, the guitar has three standard single-coil pickups that you can switch between to get the iconic Stratocaster sound (it lets you tailor the sound to what type of music you’re playing). 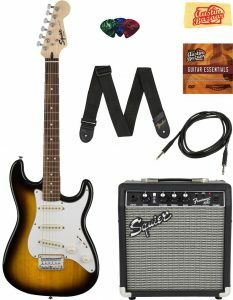 This package by Austin Bazaar comes with the guitar, a 10-watt amp, cable, strap, picks, a pack of extra strings, and some online lessons to teach you the basics. 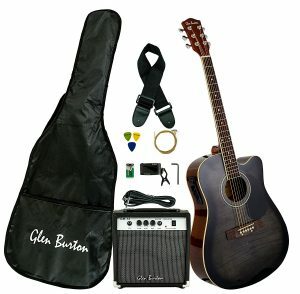 If you’re on a tight budget, the Glen Burton GA204BC0 is the best option for you. It has a sleek look with a dark wood body and rosewood fingerboard, and since it’s an acoustic-electric guitar, you can play unplugged or amped up. It comes with a starter kit that includes a 10-watt amp, a soft-shell travel bag, a strap, a clip-on digital tuner, picks, strings, and a truss rod. Given the guitar’s quality, everything you get in the starter kit, and the price, this is definitely the best value on the list. You can’t go wrong with any of the guitars on this list. They’re all excellent quality, and each one comes with everything you need to get started. At the end of the day, the best guitar for you will be the one that fits within your budget and matches your style. For beginners, learning guitar is just about picking up the instrument everyday, so be confident with your selection and jam!